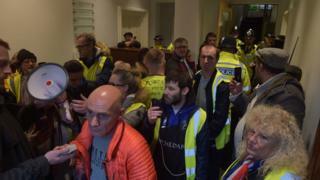 Protesters wearing yellow vests have attempted to storm the attorney general's office, claiming their calls for a meeting over the deaths of three teenage boys have been ignored. More than 20 people chanted "justice for the three" - a reference to the boys, who were killed by a dangerous driver in west London. The group refused to leave when asked by police, before moving on to outside Downing Street. Some of the protesters were at Westminster Magistrates Court on Tuesday morning, where pro-Brexit activist James Goddard pleaded not guilty to harassing MP Anna Soubry. Footage live-streamed on Facebook showed the protesters sitting in stairwells at the Attorney General Geoffrey Cox's office, shouting on loudspeakers and criticising the police. Alarms were heard ringing in the background. The group knocked on an office door within the building, shouting: "Hello, the little people are here." The protest related to the case of Jaynesh Chudasama, who was jailed for death by dangerous driving last year. Harry Rice, 17, George Wilkinson and Josh McGuinness, both 16, were walking to a birthday party when Chudasama struck them with a car them at more than 70mph on a 60mph road in Hayes, west London. Chudasama was over the legal limit for alcohol and also had traces of cannabis in his system when he hit the teenagers. His 13-year prison term was later cut to 10-and-a-half years by three judges at the Court of Appeal in London. Tracy Blackwell, the mother of Josh McGuinness, was present at the protest and was applauded as she emerged from the building. She said she had asked for a meeting with the attorney general, the government's legal adviser, but had been refused. "They just ignore the working class and that's what it's about," she said. One of the protesters, a 63-year-old man from south London, who did not want to give his name, said the group was "not far-right" but "a peaceful movement". "We have our views on politics which we're entitled to have," he said, adding that the group would march to Parliament later to "demand Brexit". Some protesters chanted "Soubry is a Nazi", which was also shouted from the public gallery at Mr Goddard's court case earlier in the day. French protesters known as the "gilets jaunes" (yellow vests), who wear high-visibility jackets, initially came together to demonstrate against an increase in diesel taxes. However, their idea has spread abroad and has also been used by protesters in the UK, including pro-Brexit activists.